The main speaker yesterday was Ian Andrews of the Institute of Advanced Motorists. We also looked forward to our Christmas meeting, and our newly-published programme of meetings for the first half of 2014. At yesterday’s monthly meeting we all enjoyed a most interesting and entertaining talk entitled ‘Age Old Debate’ presented by members of the Rochdale Branch of the Institute of Advanced Motorists. The main speaker was Ian Andrews – Senior Motor Cycle Observer – accompanied by their Chairman – Eileen Taylor – and John Bradshaw their Club Secretary. I feel that we were all encouraged by the talk even though we are no longer young drivers. Ernie Rogan gave the vote of thanks in his usual entertaining fashion! I must tell you that at the end of the meeting several members suggested that I make a request at future meetings for mobile phones to be switched off during our meetings – I’ve been told that at least four mobiles rang during the talk! Thank you for your kindness in remembering our late Chairman – David Cross – by making donations to The British Heart Foundation. We will be putting the collection boxes out again, for the same purpose, at our December meeting and then our Treasurer, Keith Coates, will forward your donations on for you. We hope to run First Aid Awareness Courses shortly and members were able to sign-up. Please let me know if you have not seen the information about this and would like to participate. The two new groups ‘Going to the pictures’ and ‘Gardening’, which were announced last month, are up and running. Information about these groups will be included in Gail Allaby’s groups report. There was also an opportunity to sign-up for the U3A Todmorden bunting making party in support of the Cragg Vale Bunting World Record attempt as a part of the Tour de France event next July. I also mentioned that Todmorden people are also making bunting for Todmorden and you can get further information from TIC and there will be an article about this in Tod News next week. We placed Gift Aid forms on the chairs for members to complete and hand to Keith and Roger Howard our Assistant Secretary. Thanks for completing these for us. Also everyone received the Programme of Members’ Meetings for January to June, 2014. It looks interesting and exciting and I thanked Anne Crane for all the work she has put in to sorting out this programme for us. I think it must be time-consuming work for which she really does deserve our acknowledgement. I attach a copy for you. Margaret Gunnill is now our Membership Secretary. As you know the signing-in table is always a bit hectic prior to our meetings starting – I experienced it last year – and Margaret already has some wonderfully willing helpers but if you would like to get involved please let me know. Peter Gibson is no longer Membership Secretary but will continue to be in control of the database – which is a very big job nowadays – we now have 344 members! This reminds me to ask that if you have changes to your contact details do please let us know. If you are currently a member receiving information by post but you can have access to a computer – again, please let us know. Postage is so very expensive these days. Peter’s new title is Database Controller – unfortunately I gave him the title of the Fat Controller at the meeting yesterday! I mentioned that when photographs are taken at our meetings, activities or groups meetings we assume that you are giving your consent for the photographs to be used in our publicity materials. If you are on Facebook please look at the Facebook u3atod page. The publicity group have put us up there and we are asking you to invite your friends to ‘like it’. The page gives up-to-date information about U3A Tod and, of course, there’s an opportunity to post your comments. We have agreed that the Groups Reports will continue go on our website, I will continue to send Gail’s report to you by email and this report will also be included in the mailshot. This means that Gail’s report at our monthly members’ meetings will focus purely on new groups and changes associated with our groups. In other words all the new news! As you know Gail Allaby – our Groups Co-ordinator – has been on holiday – only returning late on Wednesday night – but I’ve just been chatting with her and she is busily putting together her monthly report for you. Unfortunately, as I mentioned yesterday, she is not very well and I know you will all wish to join me in wishing her a very speedy recovery. Best wishes, Gail. As soon as I receive her report I’ll forward it to you. Finally, I announced details of our December meeting – on Thursday, 19th December at the usual time and place. There will be seasonal refreshments including mince pies and the now very famous non-alcoholic punch. We are thrilled that members of the Todmorden Orchestra will be coming along to play for us. Myrna Beet our Quiz Group Convenor will be devising a quiz for us – which I am sure will again be challenging as well as giving us an opportunity to meet new people – because we do the quiz in small teams. There will also be a short talk by Trevor Driver entitled ‘Humorous experiences as a Magistrate’. 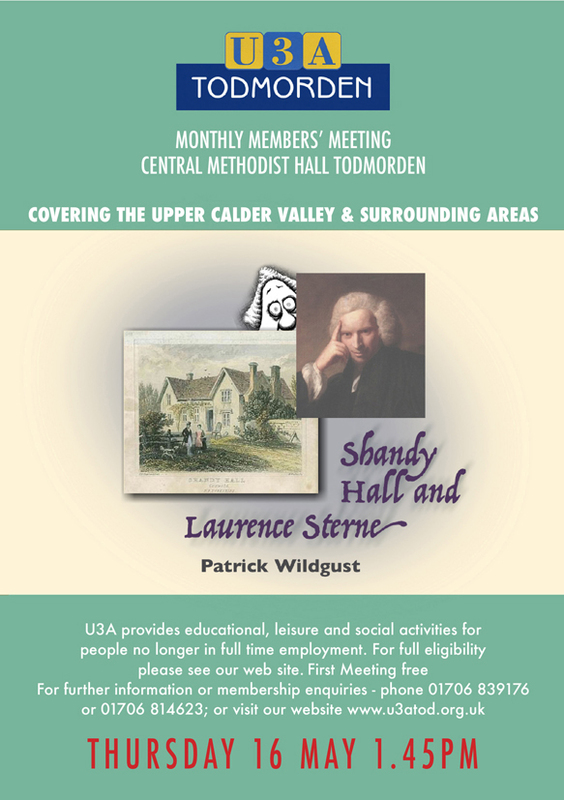 This will be a packed programme – do come along – and join all your U3A Tod friends!